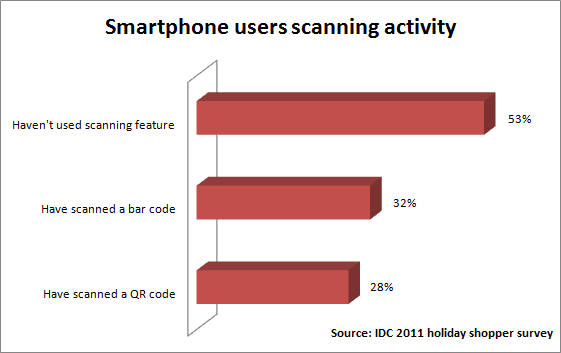 IDC’s 2011 shopper survey shows shockingly high usage of smart phone scanning tools to scan bar codes and QR codes. Nearly 1/3 of those surveyed said they had scanned a bar code. A common use of this technology is to compare prices when at a retailer. That presents a significant threat to brick-and-mortar retailers like Best Buy, who now have to compete more aggressively with online retailers. This could put a lot of pressure on high-margin items like cables, which cost $80 in store when comparable cables online are $4 or less. Although more than half hadn’t used the scanning feature, I consider these strong numbers for the technology’s adoption. There was also high overlap among the scanners: 61% of bar code users have also scanned a QR code; 70% of QR code users have also scanned a bar code. This entry was posted in local search, mobile, mobile search. Bookmark the permalink.